VeriClock is an easy-to-use and powerful web-based timekeeping tool that can accurately record time and attendance for your company’s hourly employees who are working off-site. Your employees can clock in and out of the tool by phone or Internet. Some of the tool’s verification techniques include voice authentication, GPS tagging, and recording of IP addresses. With this tool, you eliminate the need for specialized hardware or software program and doing away with the old manual time sheets. Your managers can view, verify, as well as report on employee hours in real-time. 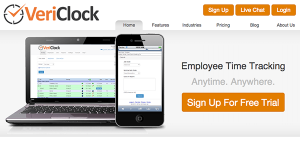 VeriClock is a web-based employee time tracking service that is perfect for those that have mobile and fixed work forces. Employees can use the tool clock in and out of work through any number of devices that range from an ordinary touch tone phone to an app to a simple web browser. Business owners and managers can then manage and monitor work time cards in real-time, get detailed reports, and import those cards into different accounting systems to save their companies precious time and money. Complementing the simplicity of the tool is a robust set of additional features including verification tools that would make sure your staff is clocking in when and where exactly you need them. Job codes, text and voice reports, and even customized data sets that are attached to each clock in/out enable employees to communicate many various pieces of information to your managers. Each organization has different needs and needs an application that can be customized for their size, kind of employees and buyers, and the particular industry they are in. For these reasons, no system can offer perfect functionality out-of-the-box. When you try to find a software system, first be sure what you want it for. Read some VeriClock reviews and ask yourself do you desire basic functionality or do you need advanced functionality? Are there any industry-specific functionalities that you are looking for? Find the answers to these queries to aid your search. There are multiple elements that you need to mull over and these include your finances, specific business requirements, your organization size, integration needs etc. Take your time, try out a few free trials, and finally choose the platform that provides all that you need to improve your firm competence and productivity. How Much Does VeriClock Cost? We realize that when you make a decision to buy Project Management Software it’s important not only to see how experts evaluate it in their reviews, but also to find out if the real people and companies that buy it are actually satisfied with the product. That’s why we’ve created our behavior-based Customer Satisfaction Algorithm™ that gathers customer reviews, comments and VeriClock reviews across a wide range of social media sites. The data is then presented in an easy to digest form showing how many people had positive and negative experience with VeriClock. With that information at hand you should be equipped to make an informed buying decision that you won’t regret. What are VeriClock pricing details? What integrations are available for VeriClock? If you need more information about VeriClock or you simply have a question let us know what you need and we’ll forward your request directly to the vendor.